I've yet to properly sink my teeth into the music of Usha Khanna, but each time I hear something of hers, I want to find out more. The last one I posted was excellent, as is 'Hawas'. There's a great, loungy vibe contained within most of the score; psych-tinged, jazz-tinged, pop-tinged - or any combination of the above. 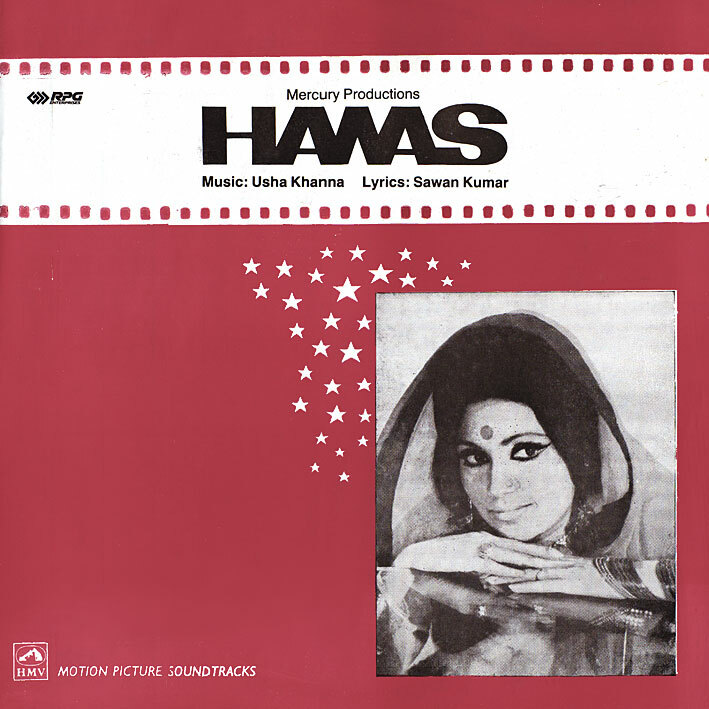 I'm particularly fond of 'Aao Yaro Gao' (a companion piece, perhaps, to Burman's 'Dum Maro Dum'), 'Yeh Hawas Kya Hai' (loads of cool jazzy details) and 'Apne Dil Men Jagah Dijiye' (with an awesome John Barry/Persuaders sound-a-like intro). To be fair though, there's a hardly a dull moment at all on this album, so well worth grabbing. I've heard it, yeah it's nice. The one of hers I'm really hoping to find is Hotel. here's a rather nice (if a bit scratchy) rip of usha's "hotel" o.s.t. it's a really great one! Memsaab! One of the few music directors? Woah! I thought she was the only one! Do you know others too? Would love to know. Yeah, don't think I've heard of other female MDs either. What's really impressive about 'Dil Deke Dekho' (which Memsaab mentioned) is she was only 17 when she scored it! Listen to Aap To Aise Na The by Usha Khanna! Besides for her, Lata has also done some composing.